This department displays our entire Lighting range. Our filter tools allow you to select the most suitable lights for your pond or garden. 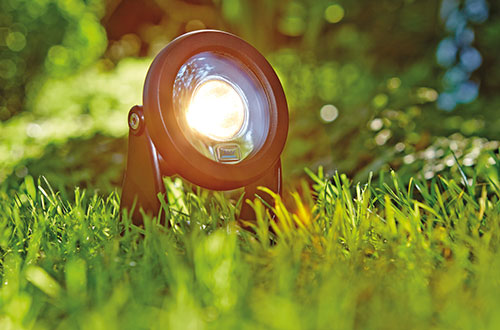 Pond and garden lights have come a long way in recent years due to innovations in LED technology. However, the range of lighting choices available can still be overwhelming. This department displays all of our outdoor lighting products and the product filters can be used to home in on the exact lighting you require for your pond or garden. Halogen lights have fallen out of favour Vs LED technology due to halogen bulbs being very inefficient in comparison, due to most of the energy being in the form of heat rather than light. Recent development in LED technology has far surpassed halogen so this is the obvious choice for future lighting projects. Choosing a conventional halogen spotlight tended to be decided by the wattage of the light, i.e. the higher the wattage, the greater the light output. LED technology is not quite as simple due to the range in quality and the individual manufacturer’s commitment and investment into research and development. Water Garden Ltd have selected the best lighting equipment for pond and garden use, in particular, OASE German-engineered spotlights. These produce superb light output Vs power consumption and in many cases are 6-12 times more energy efficient than their Halogen predecessors. As a rough guide, OASE’s 3 watt Lunaqua 3 LED spotlight is roughly equivalent to a 20w conventional halogen spotlight and are well suited to illuminating smaller ponds, water features, up-lighting of smaller trees and shrubs and have a 220 Lumen output. 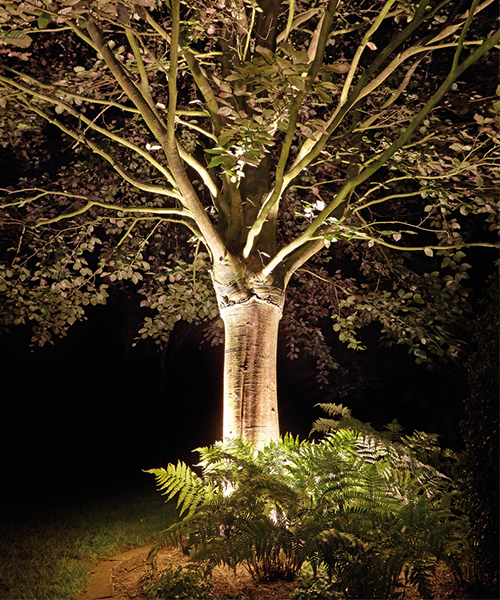 The more powerful OASE Lunaqua Power LED spotlights consume only 5.8 watts each but are comfortably the equivalent of a 50w Halogen light, so are capable of illuminating larger fountains, ponds and taller trees or water features with an output of 580 Lumens. The newly developed Lunaqua Power LED XL consume a meagre 15 watts but could be equated to a 150-200w Halogen light. Various beam angles are available so these are very versatile for illuminating tall trees, large ponds, lake perimeters and high jet fountains, producing up to 1350 lumens per spotlight.